Ooh, it's still a decent hour, I've already done my task for today, and everyone's asleep! I will ignore the dishes, the laundry, and the siren call of the Blue Bell in my freezer, and make a little bloggy time! My clutter free house is a little unraveled at the moment, but I've just got to check in with the big wide world. I had the pleasure of seeing a theater movie yesterday, and I have to admit I'm still a little giddy with thrill of it. 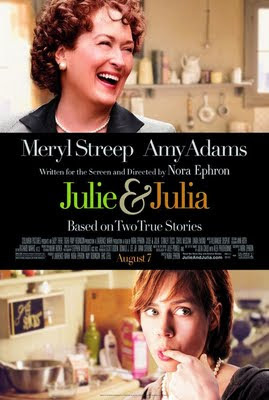 Four unrelated women, connected by our marriages to four related men, stole away for the day's first showing of Julie and Julia. This movie inspired me. In all my years of cooking, I have had less than zero interest in French cooking. Other than champagne and--well that's really about it. I love Italian cuisine, Mexican cuisine, Chinese cuisine, and Indian cuisine. I even tolerate Bar-B-Q (yes, I'm still working on a full conversion to Texan). But French? I don't even know what makes French food, well, French. And for someone who prides herself on her kitchen skills, that's probably blasphemous. I am inspired to snag myself a copy of Julia Child's Mastering the Art of French Cooking and try Julie's challenge of trying every recipe in the book. Maybe except the aspic part. No interest in aspics. At. All. I am inspired to find anything and blog about it faithfully. I am inspired to keep plugging away at writing. I did take a photo of my pepper plant today. 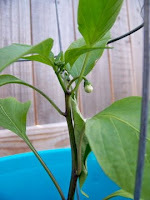 I could post daily photo updates as the teeny flowers turn into jalapenos. Call it My Little Peppers and How They Grew. By the way, I am so pleased to report that I have finished my very first ever writing assignment and mailed it off to the editor. Woo Hoo! It's just a small, unimpressive thing, a series of short reflective essays to go with a set of Bible study lessons, but it feels like a milestone. Now that I have that bit of closure, it's time to go looking for opportunities once again. 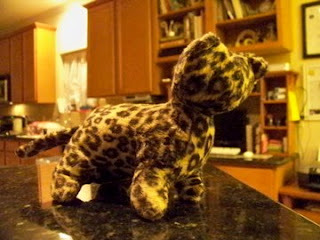 Especially since I also finished the stuffed cheetah project from last week! I felt like such an awesome mom when that turned out actually looking like a cat. This inspiration is a little overwhelming, I have more great ideas than I have time. But since most of the inspirations this week are food related thanks to Julia, I will be posting mostly over on my food blog. Why not post all my thoughts together on one website? I don't know either. Because that's where I keep all my recipes and cool food thoughts, I guess. Oh, also because I have something else being published in the next couple weeks, that directs readers to that website. Because 8 months ago when I submitted that article, I was blogging about food a little more than I have been lately. And now I need to beef it up a little since I might be getting a little more traffic over there in the near future. So I'm going to put on my chef hat now. Join me if you want, for food related fun. Just give me a day, I'm about pooped out now and need to go to sleep soon! But tomorrow, after I straighten out those dishes and clothes, and re-ravel my clutter-free house, and take Boo to the orthodontist, and stop by my local nursery's Quitting Business (sniff) sale, I hope to be right back here, food blogging away. I want to see that movie!!!! I haven't been to a real theater in FOREVER. I might have to grab a few girlfriends and go see it soon! Eat some Blue Bell for me! Congrats on the wroting assignment. That is so awesome!! I too was inspired by that movie. You'll be able to tell by my blog. God just kept speaking to me through that movie and by the end of it, I knew what I was supposed to do. It was a good movie too. Hope all is well.